I'm looking at doing a bi-weekly release schedule right now. We'll see how that works out and adjust accordingly. Okay, cool. Thanks for letting me know. The Series Premiere is HERE!!! I just watched it. Very nicely done. These will be a nice companion to the physical comics. As long as you keep banging them out, I'll keep watching. The intro dragged a little, but I thought it was all very well done. I know will certainly be looking out for more of these as they get released. Very nice work! Man! Really love these! I need to make sure Brian and Andy see the Mikey one for sure. It really does make me happy to hear you say so. I'll pass your kinds words on to the cast. TMNT #3 has arrived for your listening pleasure! Thanks again. It gives me something to look forward to every Thursday. 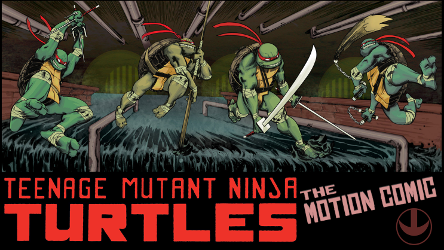 Get ready because the action is intense in... TMNT #4! Awesome motion comic! Oh, seeing TMNT #5 is going to be interesting, because somebody else on YouTube did a motion comic of that issue already, so it'll be neat to compare! Oh, yeah, I've seen that one. Hopefully ours will exceed expectations. This episode features the debuts of Tang Shen and the despicable Oroku Saki. And a special shoutout to Technodrome member Tarris Vaal for providing some of the extra voices in this episode, including the guy with cold feet. Wonderful job, everyone! I always look forward to seeing these episodes. Coming up: the official release of Hero Micro #2 Michelangelo and then it's on to #6! And now, here's the new and improved Michelangelo micro, presented in its proper place within continuity and with all of our proper turtle voices present!